Yesterday, right after my blog turned 1 year old, I added a new category under Ingredients: Cheese. This site is a continuous work in progress. As my husband notes, it is very time consuming, but as I always respond, it is immensely rewarding. Truth is, I can’t wait to keep on adding more. One of the things I have loved the most has been getting your requests, so please, keep them coming! Which brings me back to Mexican cheese, a topic I have gotten many requests for. The first kind I added is the widely available Queso Fresco. A deeply white, mild, fresh, light, barely salty, gently tangy and versatile cheese that crumbles right in your mouth the moment you take a bite. Yet, it also holds its shape beautifully if you dice it or cut it into sticks. So it lets you play with it in many ways. Aside from crumbling Queso Fresco directly on plenty of antojos like tacos, tostadas and enchiladas, one of my favorite ways to use it is on top of salads. I know, Mexican salads are not that well known. That said, I have never, in my life, seen a taco salad on Mexican grounds. There is a universe of wholesome and delicious Mexican salads to be found in Restaurants, but mostly, in people’s homes. Every Mexican household has a secret vinaigrette that is both regularly used and waiting to be screamed out. But you can rarely get the exact recipe, because they are typically made “al tanteo“, an expression that I love, which means by feel, as you go. Rather than placing the ingredients in a mixing bowl and emulsifying with a whisk as the French might do, in Mexico ingredients are commonly added in a Tupperware and shaken up until well blended. 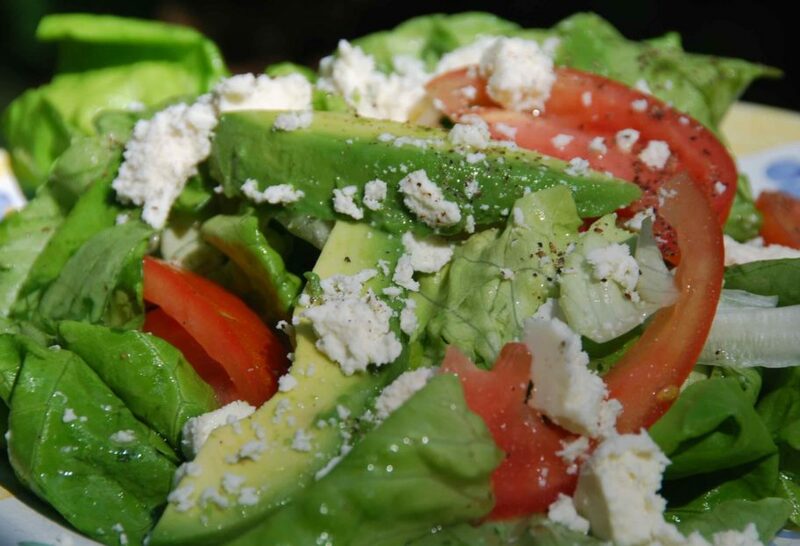 Aside from making the salad more hearty and filling, the Queso Fresco adds a nice contrast to the vinaigrette with its subtle salty and tangy notes. 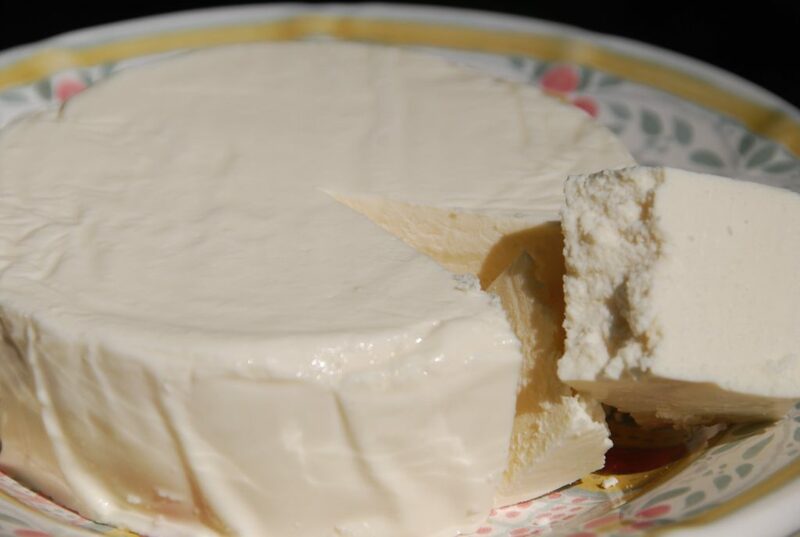 I will give you more ideas for using Queso Fresco in upcoming posts, so when you see it in the store, bring some home! For the vinaigrette: place lime juice, vinegar, mustard, honey, salt and pepper in a mixing bowl and thoroughly mix with a fork. Slowly pour safflower or vegetable oil and olive oil as you mix with a fork or whisk, emulsifying the ingredients so that they are well combined. You can also place all the ingredients in a tupperware or jar and shake until well mixed. You may make the vinaigrette ahead of time, but be sure to cover and refrigerate. Whisk it again or shake it in a closed container so that it is emulsified before you add it to the salad. 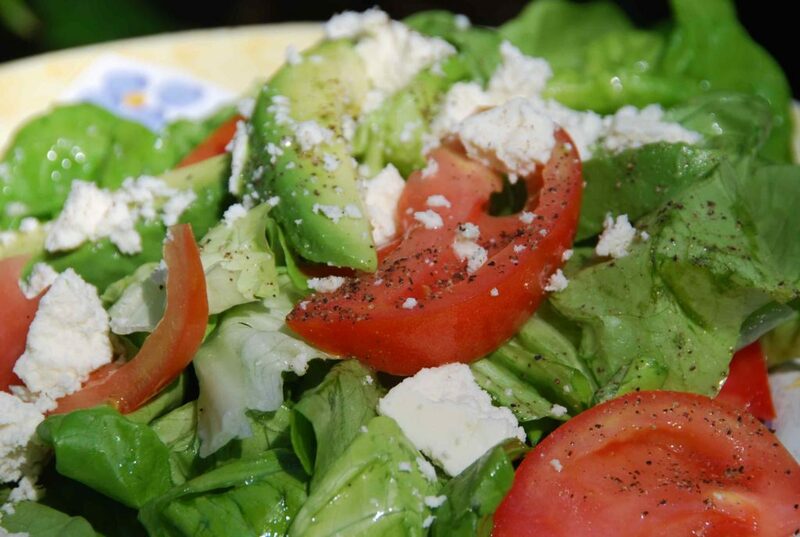 Place the lettuce leaves and tomatoes in a salad bowl. Add some of the vinaigrette and gently toss, so that the salad is moist but not soaked. Place the avocados and crumbled cheese on top. Drizzle some more vinaigrette on top and serve. Pati: What was the recipe you used last night (05/05/13) on the green tossed salad. I can’t find it, please advise. Thank you & I Love your show. Ademas de cocinar bien! rico… Se ve que eres una mujer hermosa. Es un placer. Muy amable por tus comentarios! Pati, no lo puedo creer yo tampoco. Y (para mi, como lectora asidua y amiga) ha sido un anio fantastico; como se, lo ha sido para ti. Te deseo todo el exito en este camino. Heidi, Como vuela el tiempo?? Qué tal que gracias al blogging y el respectivo tweeting, nos conocimos! Mis mejores deseos también con todo mi cariño, a tÃ­. Pronto, tendremos que conocernos en persona…. AquÃ­ o allÃ¡. Besos, Pati. Pat: Que delicia, como siempre todo lo que pones se me antoja, me haces recordar de donde soy, de donde vengo y recordar es saborear todo lo que veo aqui,ya me voy a cocinarlo….gracias! Que delicia! Sharon. Gracias Shar! Mira si respondo desde aquÃ­ ya te deberÃ­a de llegar mi respuesta directo a tu email! Muchos besos, Pati. Yum! A yummy salad for a warm spring day. And I can’t wait for you to post on Queso Oaxaca, which is my favorite. I used to think queso fresco was it, but no… Jeje.